Shanghai MAC Machinery can supply the wellheads and Christmas trees suitable for land and offshore applications to explore, develop and produce oil. We design, manufacture, test and control these products in accordance with API 6A, latest edition and also hold a Certificate of Authority to use the API monogram for API 6A products. The main pressure-containing parts of t hese products are made from forgings or specially smelted low alloy steel (stainless steel) casings for high bearing strength. 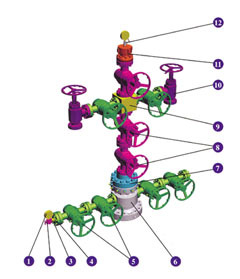 Wellheads manufactured by our company are available in pressure rating up tof105MPa, load rating up to 500 tons, material classes from AA through FF, temperature classes from L through V, product specification levels from 1 through 4 and PR1 & 2, and also meet NACE Standard MR0175. The wellheads, Christmas trees and auxiliary equipments supplied by Shanghai MAC Machinery are available in many different kinds of configurations, meeting requirements of all kinds of bore frames and casing programs and providing service in different working conditions. They are also available upon customer request. 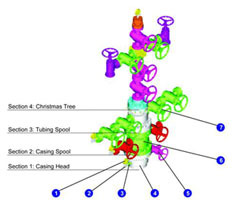 Our wellheads and Christmases have won great acclaims from the customers. Most of our products have been exported in batches to many countries and regions, such as USA, SYRIA, INDIA etc. 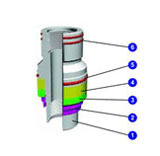 The casing head is a kind of part of connecting casings and wellheads. It is used to support the weight of technical casing and intermediate casing and seal the annular space between the casings, which provides a transition joint for the installation of the tubing head, Christmas tree and other wellheads. The two-side-outlet design allows the casing head to supply cement, monitor and control well's sinking, and inject balance liquids etc. The casing head produced by our company has a standard configuration, which accepts the casing hangers produced by our company. These casing hangers can be available in different sizes according to the casing procedure and the change of well head condition. 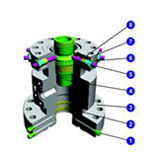 The top flange of the casing head is in accordance with the requirements of API type 6B or BX flange. It is available with such bottom preparations as API CSG female threaded, API BTC female threaded, slip-on weld and slips. 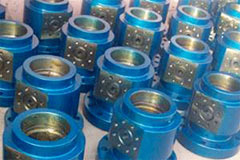 It can be provided with weld-group supporting base plate. Its side outlets are LP threaded or Studded. The studded outlets contain 1 1/2" valve removal threads. 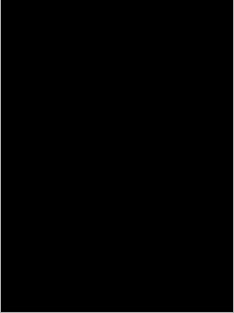 the annular space between the tubing string and intermediate casing, consisting of tubing head spool and tubing hanger. 4) The tubing head spool is provided with both side outlets for injection and well clean-up operations. connected with tubing and seated into tubing hanger spool by tubing gravity. 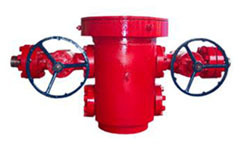 It is convenient to operate and replace wellhead so that it is widely used for intermediate depth well and common well.